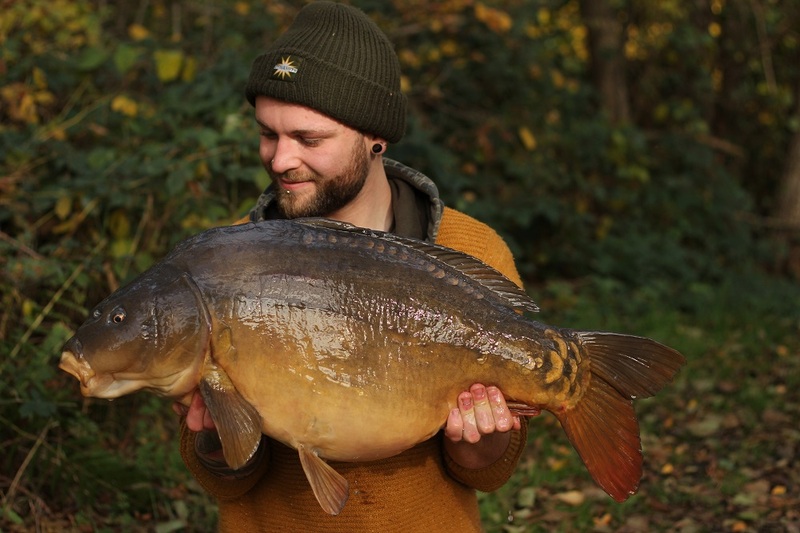 Top carper, Dave Williams recalls his exploits from a successful mid-summer on a new Yateley water..
With the Match Lake being the Match Lake, the fishing only got progressively harder through October. After two more blank sessions I decided to bite the bullet and get a ticket for another nearby water for the winter. With my birthday coming up my dad and my brother very kindly decided to pay for the ticket for me. Before I knew it me and my mate Tom were rumbling down the track that leads to the lakes. I locked the van and we set off for my first lap. We passed two lakes before reaching the lake I’d be targeting. It’s a small gravel pit of about 6 acres with loads of snags and lilies around the margins and two islands that divide up the lake. I didn’t see any fish during that first afternoon and settled for an area that was more of an open water swim, hoping to see some fish show more than anything. I found a nice little spot in the margin and one out at the bottom of the island margin slope. I baited both rods with CompleX-T Fluro pop-ups and spread about a kilo of The Crave and CompleX-T freebies over each rod. The night passed uneventfully and I spent the remainder of the next day trying to find some fish to target in the edge. The only opportunity that did materialise for me however, came to an abrupt end with the arrival of two swans which soon cleared the swim of bait and carp. The following week I had a plan in my head to target a spot along a set of snags that gets the brunt of a southwesterly wind. Upon arrival I settled into the swim I wanted to get in and flicked one rod up close to the trees to my left and the other out to a set of dying pads out by the island in front. Both spots were clean gravel so I fished Combi rigs on a helicopter set up on each rod. I baited this with a 12mm Monster Tiger Nut boilie and a piece of artificial corn. 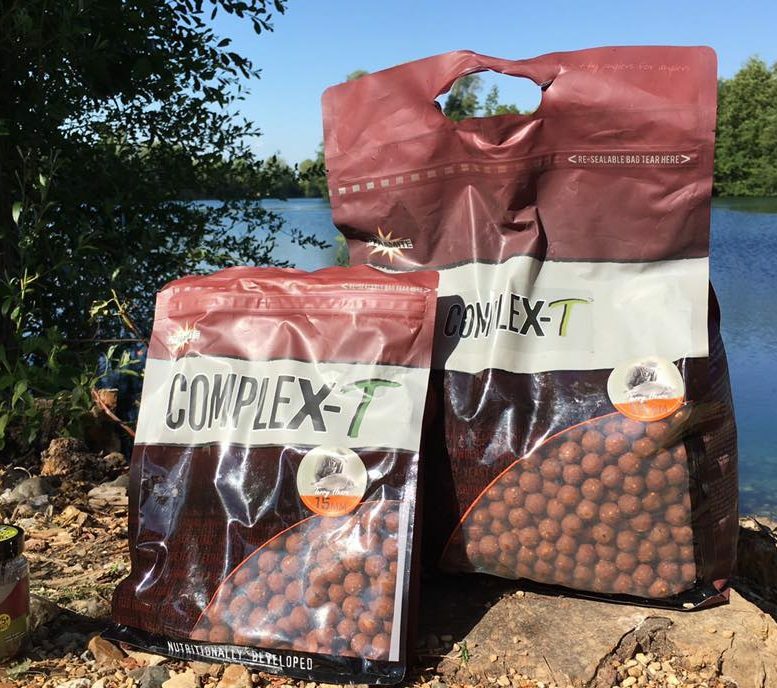 I then baited the spots with a couple of handfuls of 4mm Monster Tiger Nut Pellets, XL Corn and a mix of 12mm Monster Tiger Nut and Red Amo all soaked in the Sweet Tiger Liquid. It was dark before I arrived so I quickly set the brolly up and fell asleep. I awoke at first light to a lifeless lake. I sat up drinking coffee all morning and it wasn’t until about 10am that I got any sign of a fish at all. Fortunately it was the rod down my left hand margin melting off and after a pretty slow and short fight I’d got a wrinkly old mirror sat in the net waiting for it’s photos. 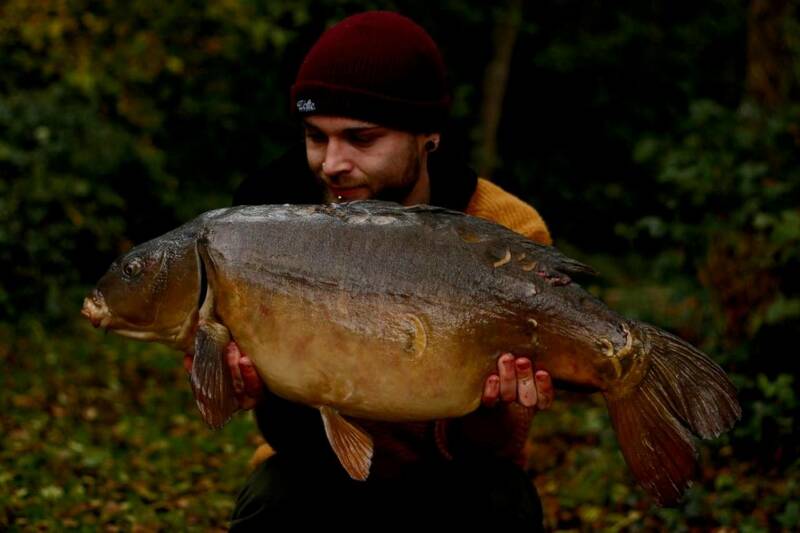 At 31lb exactly it was the perfect way to start the winter campaign on the new lake. With the fish released, rod positioned back on the spot and another liberal dose of bait over the top I sat back in anticipation of another take. That night the temperatures really dropped and it was -5 when I stirred about 4am. I sat up and had a coffee but the lake seemed dead so I went back to sleep to wake at first light. I had to endure a couple of hours of fizzing from first light until I got my next bite. The rod against the snag wrenched round eventually and I was on it straight away. Unfortunately I lost the fish in said snag and decided that my chances fir the day were probably done now. I walked the lake, found a couple of new spots and baited them in preparation for my return the following week. I continued the start of my campaign on the new water through into November. I was fishing the same swim and spots and baiting them regularly with Monster Tiger Nut boiliies and pellets and fishing them two nights a week. The first week of the month saw heavy frosts and freezing temperatures and the even though I fished that week, I didn’t see a single sign of a fish. The following week after that I kept wondering if I had just fallen lucky when I’d had the two takes in the swim previously and the fish weren’t normally here. Nevertheless I returned the following week with an extra night for my birthday. I doubled up with my good friend Tom and we fished a rod each either side of the swim. I stayed on my baited spot under the snag. The first night was really cold again but we did hear quite a bit of fish activity. Throughout the second day I didn’t move my rod at all and left everything as it was. The wind changed that day and brought warmer temperatures with it. The fish were active again that night showing round the back of the snag I was fishing under and I was confident of a take. At first light my rod wrenched round and I was pulling a lovely mid 20 common out the snag. On the mat it was passing out the bait everywhere so I knew they were still on it. 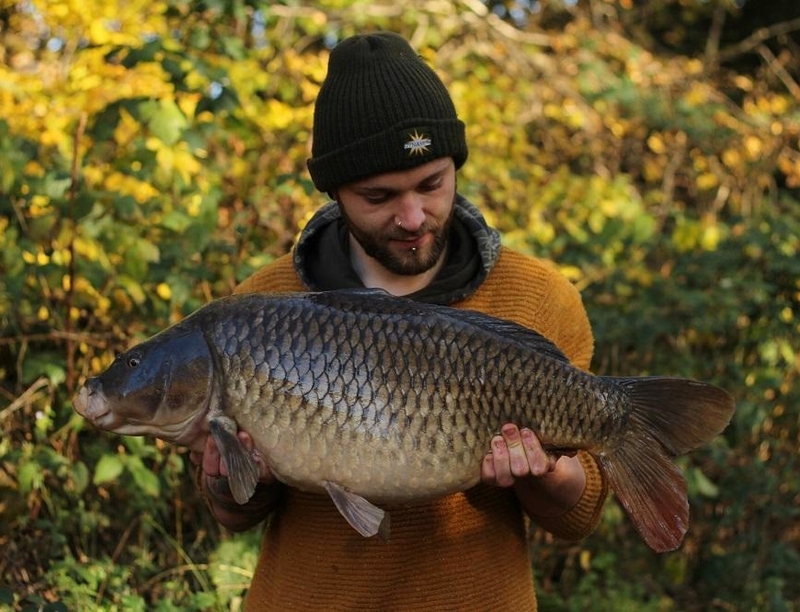 The fished weighed 26lb 8oz and was just an immaculate brick of a carp. I was buzzing to have caught it and got the rod back out and baited up again with a mix of pellets and boilies. I hadn’t had an afternoon bite yet from this lake so I was quite taken a back when my rod rattled off again at about 1 o’clock. This fish was fight much deeper and just hugging the bottom. The fight seemed to last ages before a decent sized mirror rolled over the cord. It went 32lb 8oz and was my biggest from the lake so far. We got a few pictures before I slipped her back and re did the rod again. Unfortunately I didn’t have any more action that trip and couldn’t make it out the following week due to my dog having to go to the vets. The last week of November was my next trip and I got down on the Monday night after work absolutely knackered. I only bothered to put one rod out under the snag before going to sleep. Again at first light I was woke up by the bobbin cracking into the blank and landing a nice little mud double mirror. Unfortunately I lost the only other bite of the trip due to a hook pull trying to keep the fish out of the snag. My first month on the new lake has been a fruitful one and I’m looking forward to catching so more of these lovely carp over the colder months.